Hell Hole is the story of former Rough Rider and current New York City Cop Nat Blackburn and his journey on a mission from his old war pal, President Theodore Roosevelt. The mission is seemingly simple: head to a little town called Hecla in Wyoming. Roosevelt tells Nat that the town was a huge source of copper and other minerals, causing it to explode in growth overnight. However, the copper veins eventually dried up and Hecla collapsed, despite rumors of gold being found in the mines. Not only did the town’s prosperity fall apart, but the residents of Hecla disappeared without a trace. Naturally, Nat thinks it is because of something easily explainable like Indians scaring off the settlers, who they see as intruders on their land. Roosevelt dashes that theory when he reports that he sent a troop to investigate and they reported that even the Indians were terrified of the desolate town. To make matters worse, shortly after their report, the squad disappeared without a trace. So, with that, Roosevelt enlists Nat to head to Hecla in order to find out what is going on and how to best extract the gold from the hills for a fledgling United States that desperately needs more wealth. 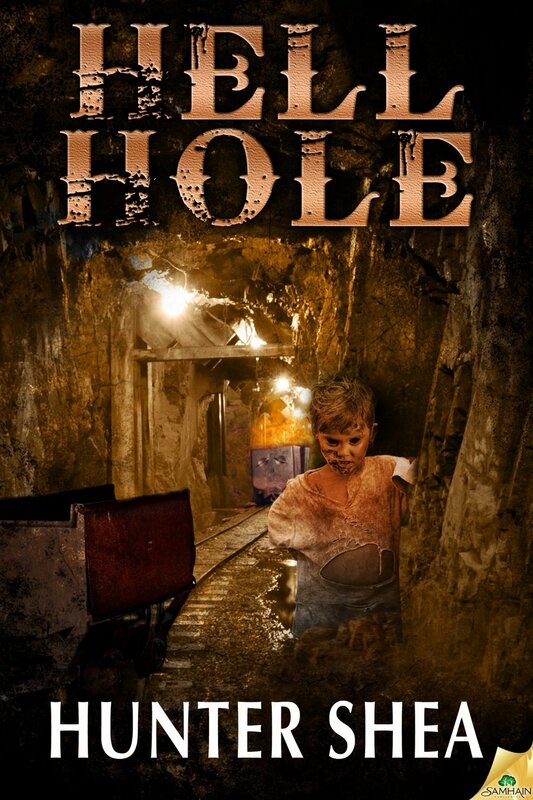 When Nat and his longtime friend Teta arrive in Hecla, it becomes clear that their mission is anything but simple and there is something evil lurking in the abandoned mines of the town. Shea blends all of the best action elements of the western genre with the sinister edge of horror to create a book that is an absolute blast to read and impossible to put down. What makes all of Hunter’s stories so enjoyable is that he does not waste any time bringing you right into the action, giving you a glimpse of the evil waiting deep within Hecla’s caves within the very first chapter. Even when we learn the backstories of the characters and the town, there is no lull in the intrigue that drives Hell Hole. By giving a lot of the background from Nat’s point of view, these little tidbits are every bit as interesting as the main plot. The characters in Hell Hole are, simply put, awesome. Nat and Teta are two no-nonsense badasses that forged a life-long friendship during their time in war together fighting Spain. Their friendship feels very realistic and it is obvious that they would literally follow each other to hell and back. What makes them my favorite characters is that despite the adversity they face in Hecla, they not only don’t give up, they relish the challenge. There are moments where they are terrified by what they see happening around them, but instead of tucking their tails between their legs and heading home, they use the hardships they encounter as fuel in order to destroy the source of the evil in Hecla. Not only were the action sequences awesome and highly entertaining, but from a horror standpoint, Hell Hole is everything you could possibly want. I mean the story is jam-packed with a host of horrifying entities including extremely creepy children with black eyes, Bigfoot-esque creatures and others that I don’t want to spoil for those who have yet to read the novel. Hell Hole comes with my highest recommendation and is a great starting point for those interested in checking out Hunter’s work. This story begs to be up on the big screen, so if by some small chance any movie producers are out there reading this, give Hunter a call! Reblogged this on From Bright Minds Come Dark Things. WHAT PARTS I DID READ SOUNDS LIKE ITS GOING TO BE GOOD AS THE OTHERS DID I WIN COPY LOL,,ALL UR BOOKS I READ R GOOD.